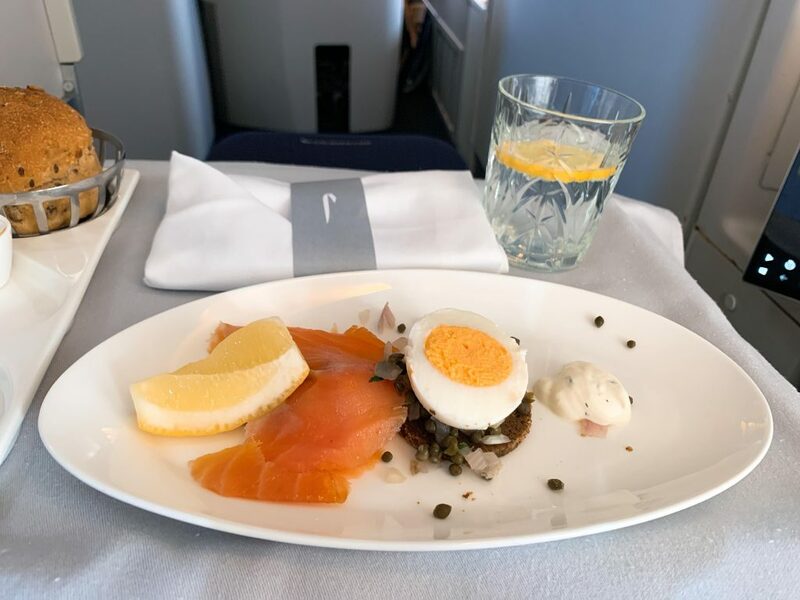 This fare was an Avios redemption using the now demised Lloyds Avios upgrade voucher. 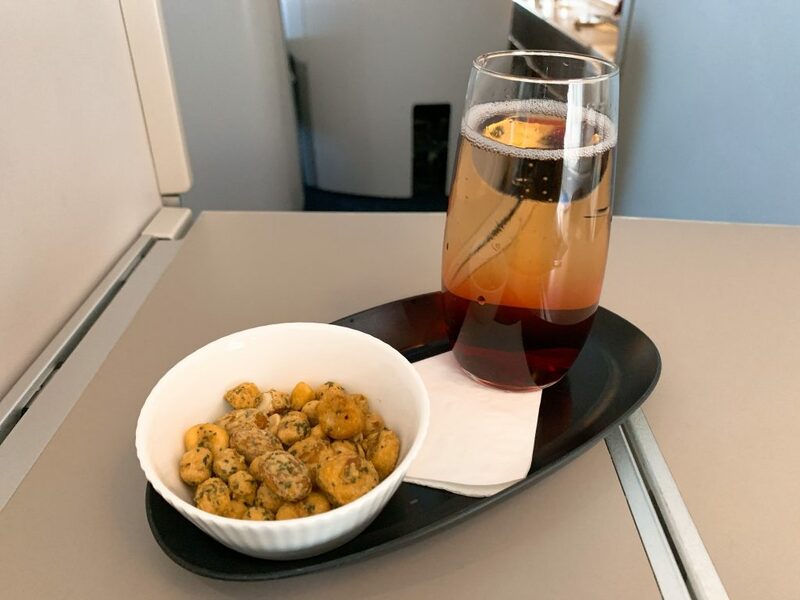 I paid 65,000 Avios for World Traveller Plus and used the voucher to upgrade to Club. Taxes and fees were £577. The voucher saved me 60,000 Avios on a regular Club World redemption. Check-in at T3 is always something of a disappointment compared to the First Wing at T5. The general check-in area still feels dated and gloomy due to the old terminal building, lack of daylight and low ceilings. Being a Gold Card holder, I checked in at the First desk which is in a separate area. 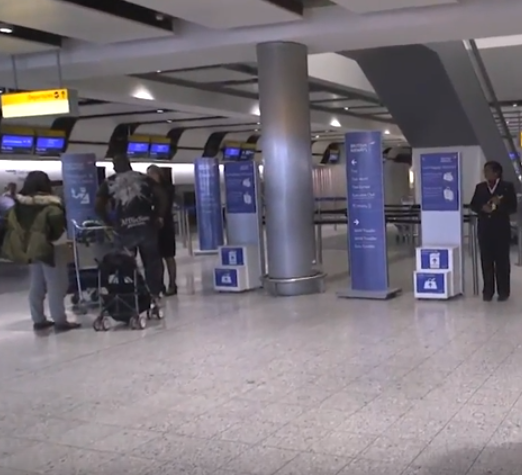 BA has at least announced that they will be redoing this area in the future with a joint AA/BA check-in area and First Wing type experience (although not into the lounge). I only had a short wait, and the agent was charming. T3 has one of the best selections of lounges in the world for oneworld travellers. As well as the BA lounge there is also the Qantas, Cathay and AA lounge to choose from. Usually, I would have popped into the BA lounge to try to get a complimentary spa booking. You can find the page of free Elemis treatments here. Unfortunately, I had been delayed by traffic so didn’t really have enough time. If you are curious about the choice of lounges, you can see my article on the best lounge to choose at T3 here. There is a comprehensive review of the BA T3 lounges here. 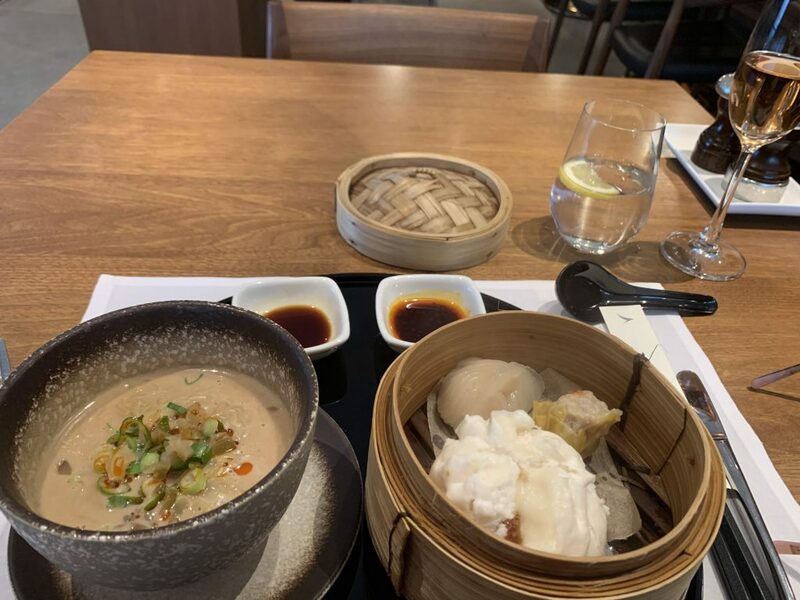 I always try to have something Asian in the Cathay lounge and this time I went for the classic Dan Dan Noodles and dim sum basket. You can also get these at the Noodle bar in the business class lounge next door. Unfortunately, I had yet again been selected for SSSS. If you have never had this, it is where you are selected for extra screening when you go to the US. It means that you will not be able to retrieve your boarding pass online which is very annoying. Once at the gate you need to report to the gate staff who will direct you to a special waiting area. The boarding area was an absolute scrum. Although there were signs for group 1 and then a joint Group 2 & 3, the lines all merged into one giant crowd, and I had to fight my way through to get to the group 1 line. 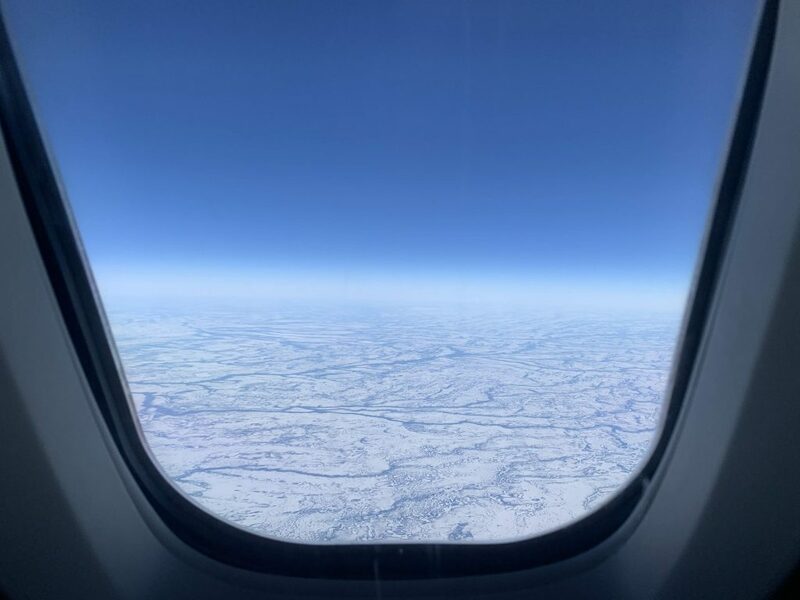 Once on board, I knew straight away – a bit like a great first date – that this was going to be a fantastic flight. I was heading up the steps to the Upper Deck when the cabin crew member hurtled down the stairs to help me with my carry on. This is not something I have experienced before. This was then followed by a very sincere Gold greeting from the acting CSM. He chatted with me about my experience in T3 which I thought was a nice touch. 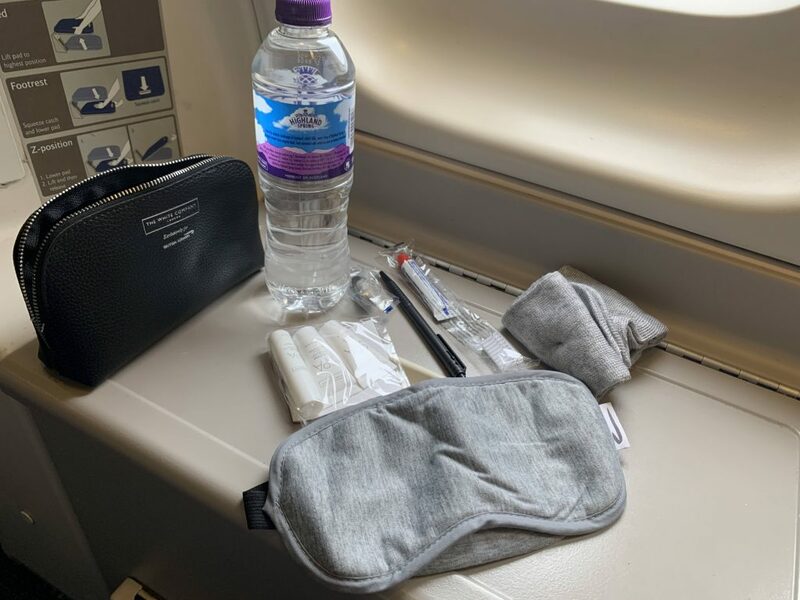 Next my cabin crew member Anoushka introduced herself and handed me a washbag and a bottle of water. I was also given a menu and a hot towel. Anoushka was absolutely outstanding the whole flight and one of the most proactive and lovely cabin crew members I have ever encountered on BA, particularly in Club. 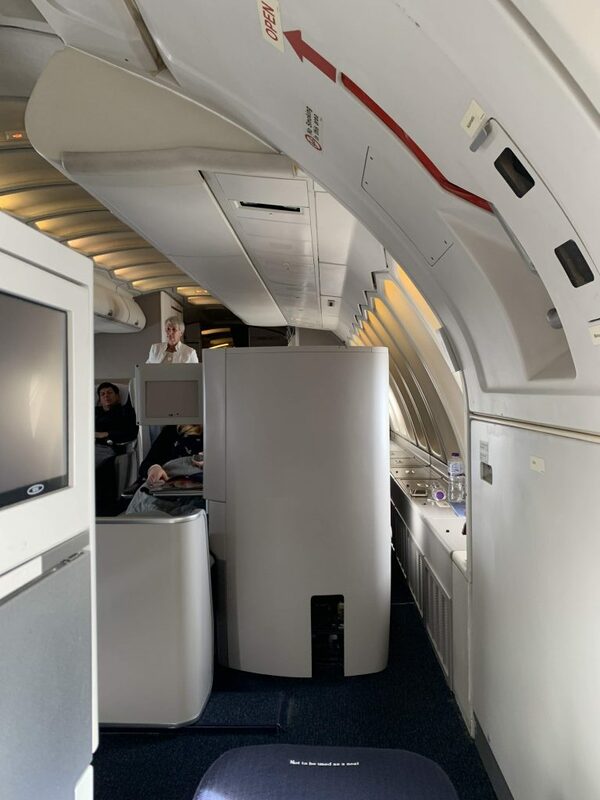 If they could just clone her and the wonderful cabin crew from my First class B747 flight, BA would have some world class service! 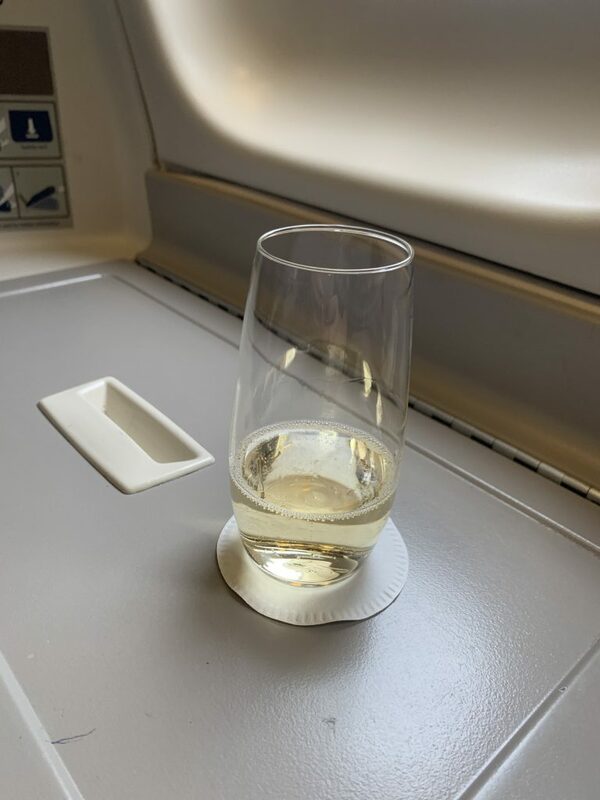 I was offered a choice of water or champagne as a pre-departure drink but as you can see they weren’t the most generous measures. 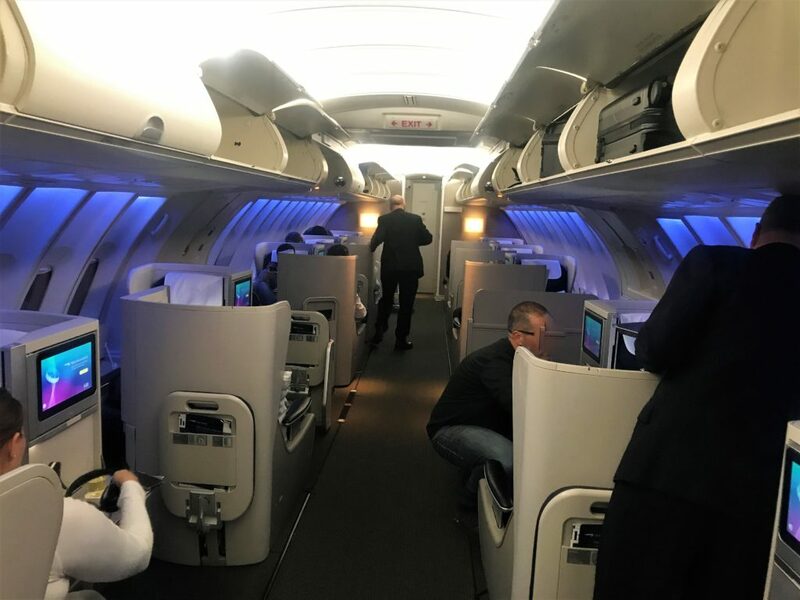 BA gets a lot of stick for their current Club World seat. 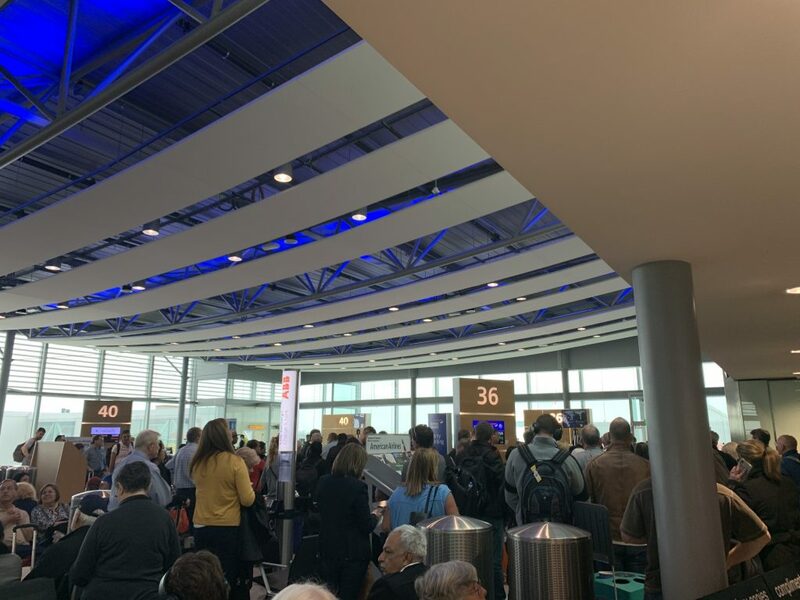 I agree that I hate stepping over people and the awkward dance of avoiding eye contact with a complete stranger until the safety demo is over and you can put the privacy screen up. However, if you get a good seat then actually I quite like the seats. This was an unrefurbished B747 so showing its age in places. Overall though the cabin appeared pretty clean and my seat was not overly worn. I had gone for one of my usual favourite seats – 62A. This is an emergency exit seat, so you do not have to step over anyone to climb in and out. With the screen up it is also pretty private. I also recommend 62K and 64K. Some people also like 64A, but I am not keen due to the proximity to the toilet and stairs. These seats are reserved for Gold members/bassinets, but you may also be able to get them at online check-in. I always choose the upper deck as the cabin is smaller and quieter. I also love the extra storage space that you get with the side bins. The downside is that the overhead lockers are very small and I couldn’t actually get my case above my seat which was annoying. For storage as well as the two side bins there was also a draw suitable for a small laptop. This is one of the flaws of the old seat in that there is no storage except at floor level and nowhere to put a bottle of water or a laptop/iPad if you want to watch your own content while eating. I found the seat comfortable for sitting, working and sleeping. The seat has a separate footstool which can be a little flimsy, but this one was fine. You can adjust the footstool manually, and the seat can be moved to any level of recline which is useful. The table is a little small, and I don’t find it very good for working as it is very bouncy, but I did manage to write nearly all this review onboard! Even though this was a day flight, I had a short sleep after lunch. I find this the best way to beat jet lag to the US. I have a short nap as soon as possible after takeoff and then usually manage to stay up to a reasonable time when I land in the US. 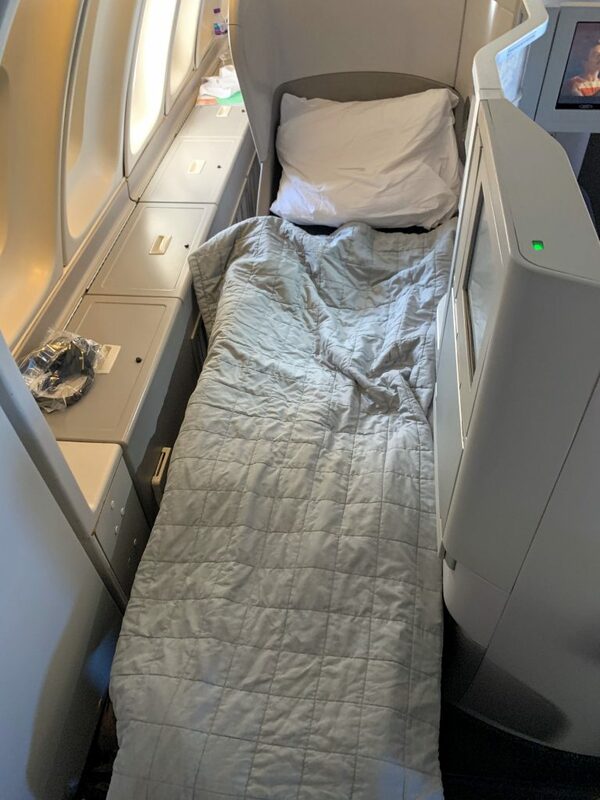 BA recently introduced new bedding from the White Company, and I find this very comfortable. You get a mattress topper, a day blanket and a lovely soft lightweight quilt. With the bed made up, I found it very comfortable and slept well for a couple of hours. I was offered a pre-lunch drink for which I decided to have a Kir Royale. BA now have Canard Duchene champagne which is an improvement on the Castel-no in my opinion. There was also a Rose Besserat de Bellefon champagne which I plan to try on the way home on my A380 flight. The Kir was served with some nuts on a non-slip tray. I was not keen on the new nuts. In fact, I wasn’t even sure what they were! It seemed to be possibly vegetable based with some sort of coating. I would be happy if they went back to the flavoured pretzels you used to get. I was offered a top-up of my drink twice before lunch which I thought was very impressive. The actual time for the meal wasn’t too bad although they were a little slow initially to get the drinks out. I had finished my meal at about 2.5 hours into the flight. 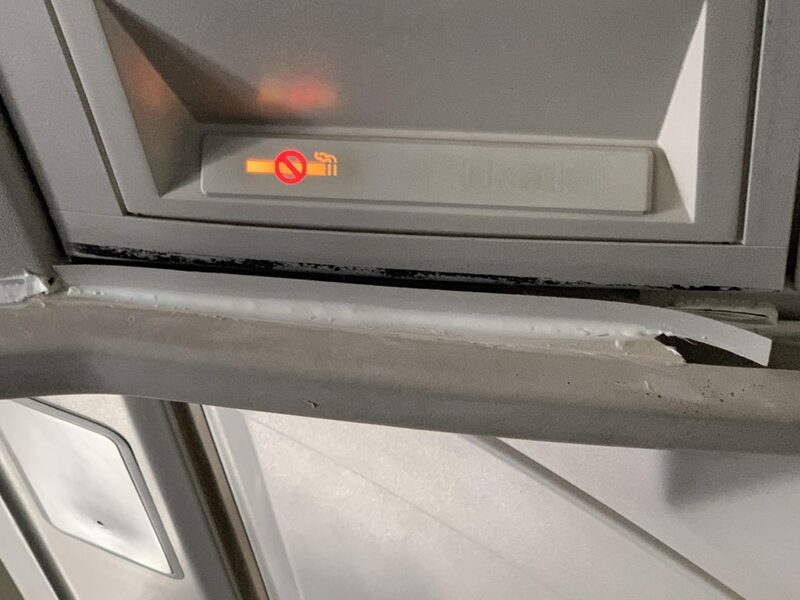 The crew did even apologise about the timing of the meal as they had been having issues with the IFE (see below). I had chosen the salmon starter. It looked fairly unremarkable and was tasty but nothing to rave about. It could have done with a little more dill crème fraiche. It was served with a warm roll and butter though you could ask for olive oil instead. The bread was delicious with a crusty exterior and a lovely malty fluffy inside with various seeds for interest. However, I think BA could go back to the traditional bread basket delivery to offer a choice. My main complaint was the frankly terrible white butter! Butter should not be white! Some good salted butter would be a much-needed addition. The main course was superb and one of the best meals I have had in Club. 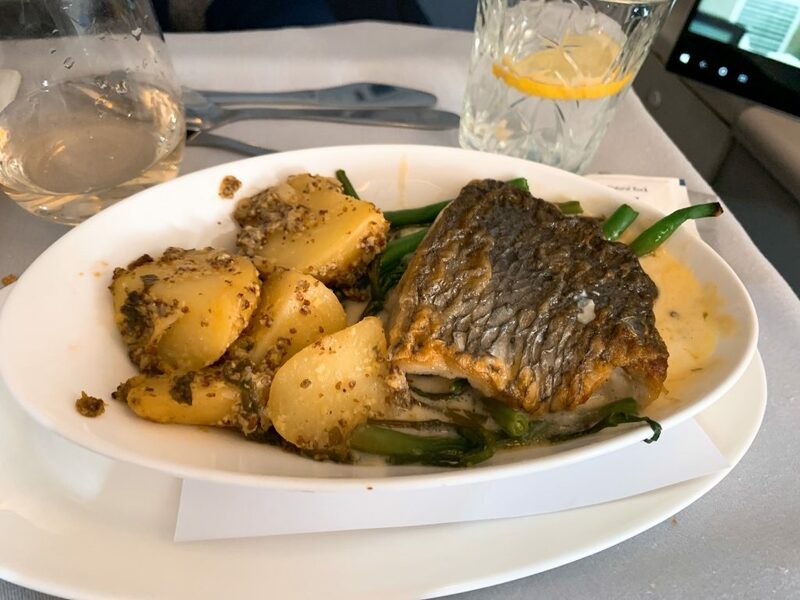 The fish was perfectly cooked and very moist which is no mean feat on an aircraft! There was a lot of attention to detail with the potatoes having a punchy mustard and herb coating to add some interest. 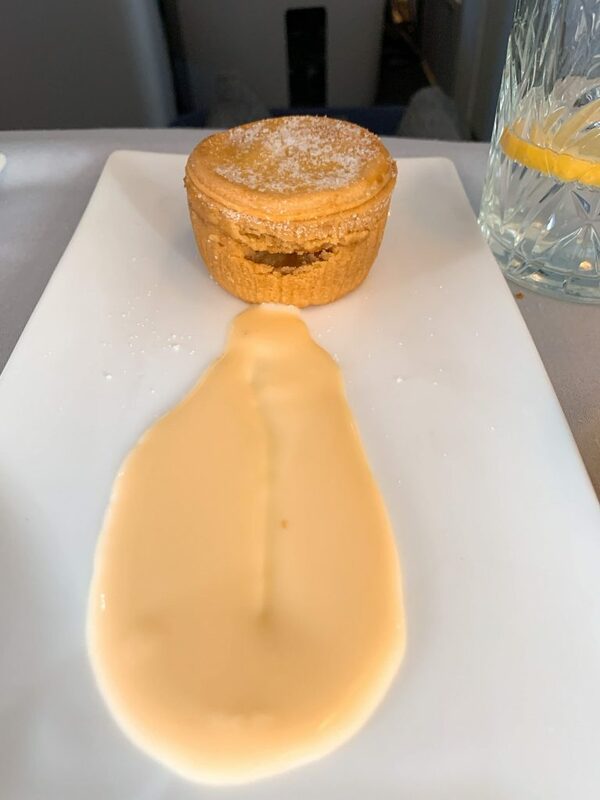 The highlight was the creamy lemon beurre blanc which had a great depth of flavour and had enough acidity from the lemon to balance out the creaminess. I could have actually drunk a pint of it as it was so good!! It tasted a lot, lot better than it looked! I finished with the warm apple pie and custard (or crème Anglaise if we are trying to be posh). This was tasty and not too soggy, but the proportions were wrong with far too little custard for the pie. During the rest of the flight, snacks were available from baskets placed at the top of the stairs with biscuits, crisps and chocolate. There is also a more extensive version of the Club Kitchen in the downstairs galley. I was impressed that Anoushka went around the cabin with the snack basket too and regularly offered me drinks. There was a second meal served at 90 minutes from landing. I am probably in the minority that I miss the afternoon tea. I am never normally that hungry for the second meal, and I liked the Britishness of afternoon tea. However, the sea trout starter was delicious and the steak sandwich was tasty although the steak wasn’t the best quality but it was tender enough. Here was what let the side down. 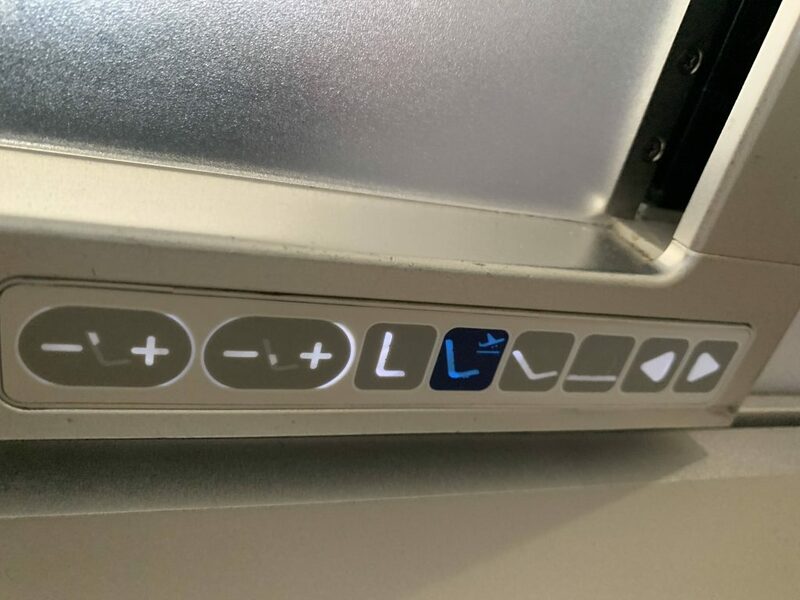 The screens on the old B747s are quite terrible being frank. They are small, fussy and years out of date. Mine was very stiff, and I couldn’t get it to fold out completely at right angles. I always take my own selection of Netflix downloads with me anyway so I was not too bothered when the IFE didn’t work. If you hadn’t done this, you might have been disappointed as it took two resets to get it going. There was actually quite a good selection of new and older films, but as I had been travelling long haul so much, I had seen all the films I wanted to see, so I stuck with Netflix. Noise cancelling headphones were provided. I find these work OK but are not that comfortable on a long flight, so I stuck with my own Bose QC35s. There was in-seat power, but it needed a US adaptor which can be annoying if you don’t carry one. Unfortunately, this did not work initially, The lovely Anoushka was soon on the case, and after two resets we got there. She even offered to lend me her own charger to see if that would help! What can I say about the service – wow, just superb! I can forgive an awful lot if I get this sort of proactive, friendly, above and beyond service! 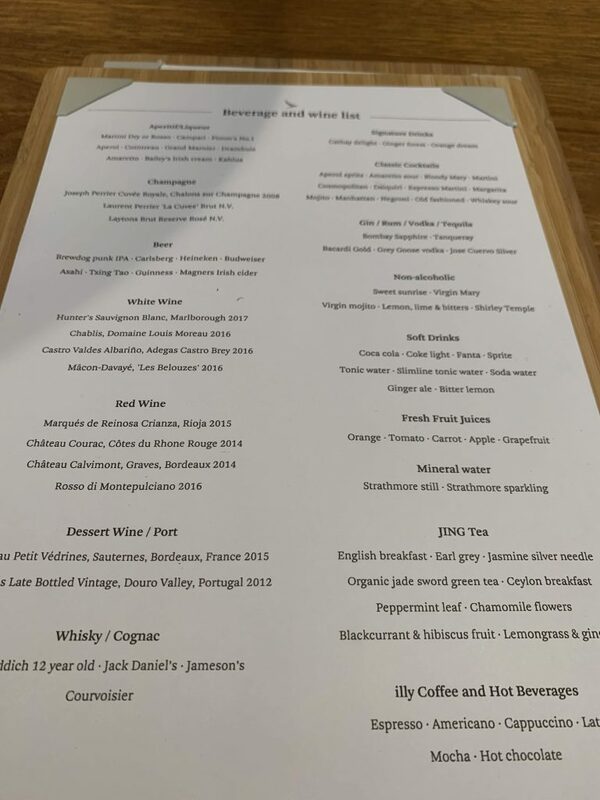 The drinks were a little underwhelming, but I really enjoyed the food, particularly the outstanding main course. 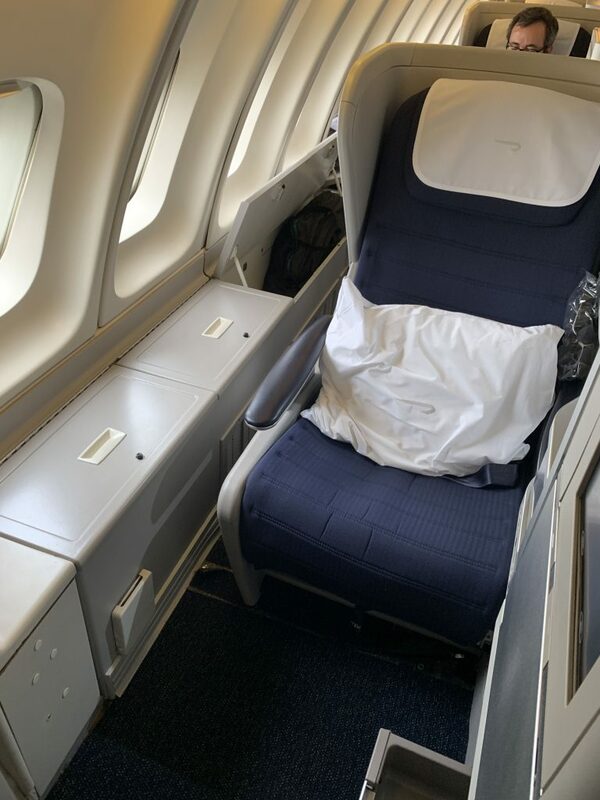 For me, the seat does the job if you get an aisle access window seat and I always enjoy a trip on the upper deck of the B747. I slept well and enjoyed the privacy of the seat. 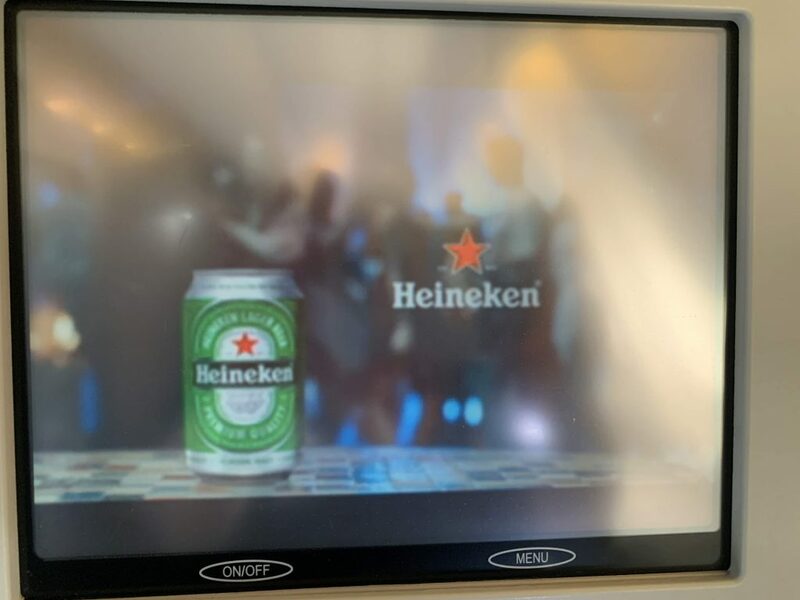 If they could just improve the IFE screens, I would have been totally satisfied with the flight. You can find out more about flying Club World here and read my other Club World reviews here. 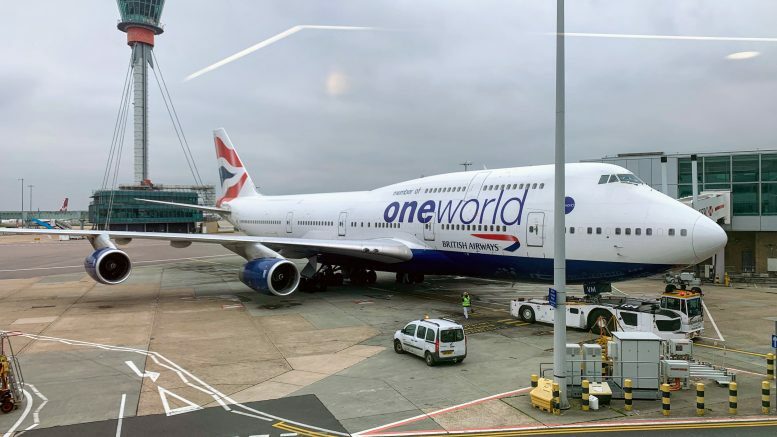 11 Comments on "To above and beyond – British Airways Club World B747 upper deck review"
What you say about seats in rows 62 and 64 being reserved for Gold members and bassinets is not correct. I am a silver member and book those seats regularly as they are my favourite too. If you are not Gold or Silver, you can still pay a fee to book the same seats. I’d be interested to know what your favourite Club seats are on the A380 BA plane? 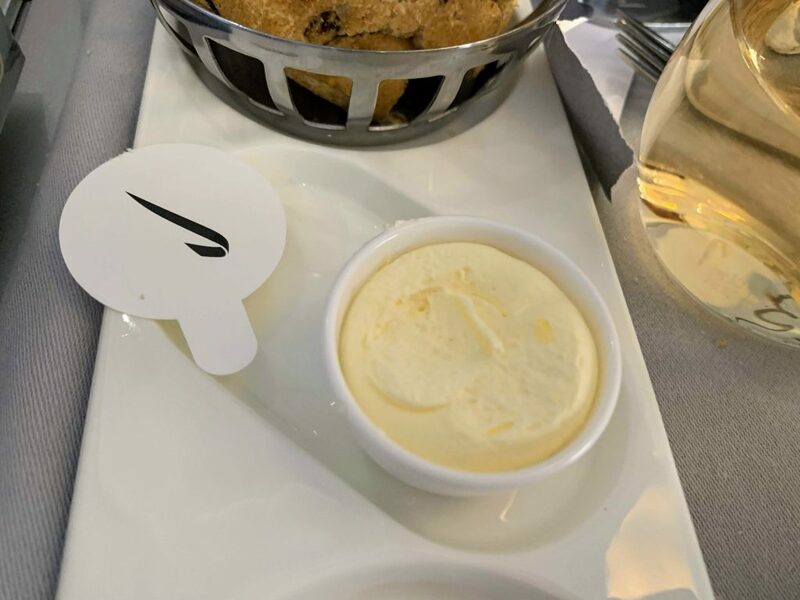 That isn’t butter. It’s a nasty whipped margarine type blend. British Airways are ludicrously mean. 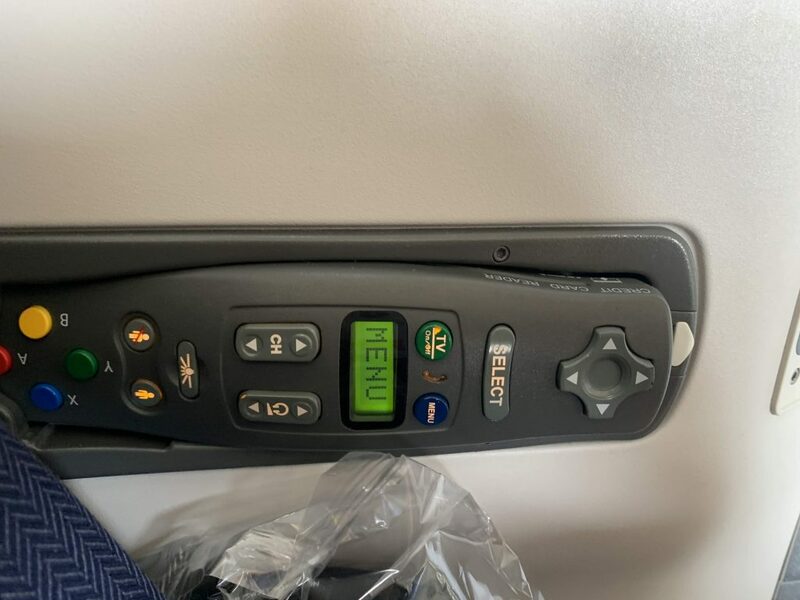 In economy you get a a butter portion. 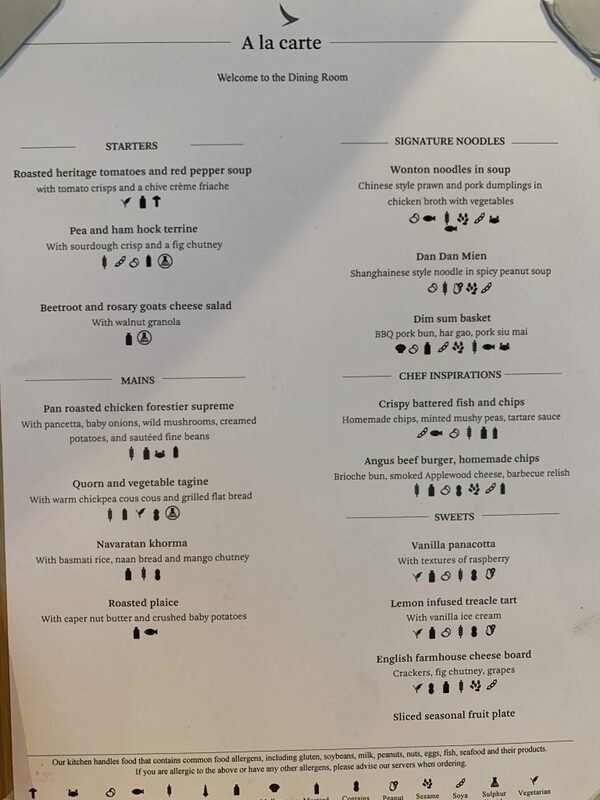 BA opts to make it look like the portion in Club World is more generous by faking real butter. The laughable thimbleful of pre-departure champagne is common. BA CW is still a poor product. Nice staff never compensate for that. I feel sorry for the CC serving this food and drink. Thanks for another very interesting review. I am travelling in First to Denver from T3 tomorrow. Can I use any other lounges apart from BAs? Thanks! 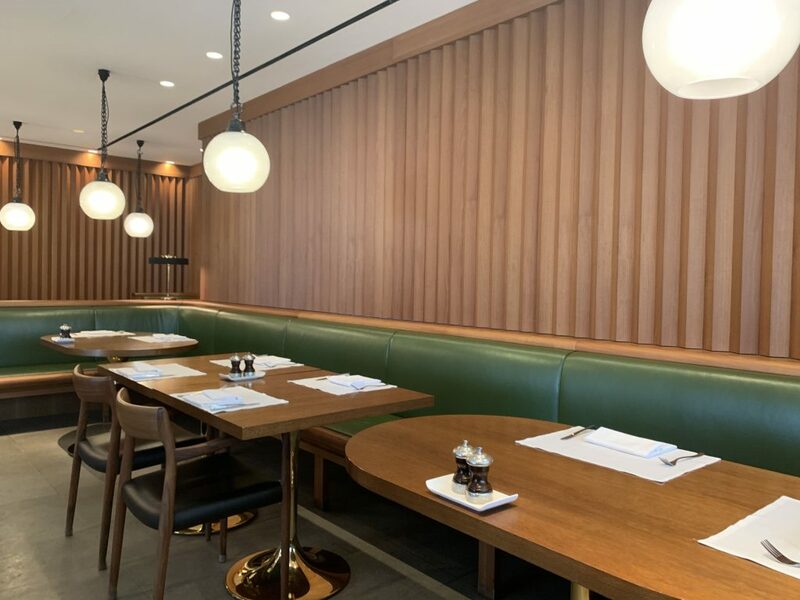 Yes you can use AA Qantas Cathay or BA First lounges. THis is quite sad really. 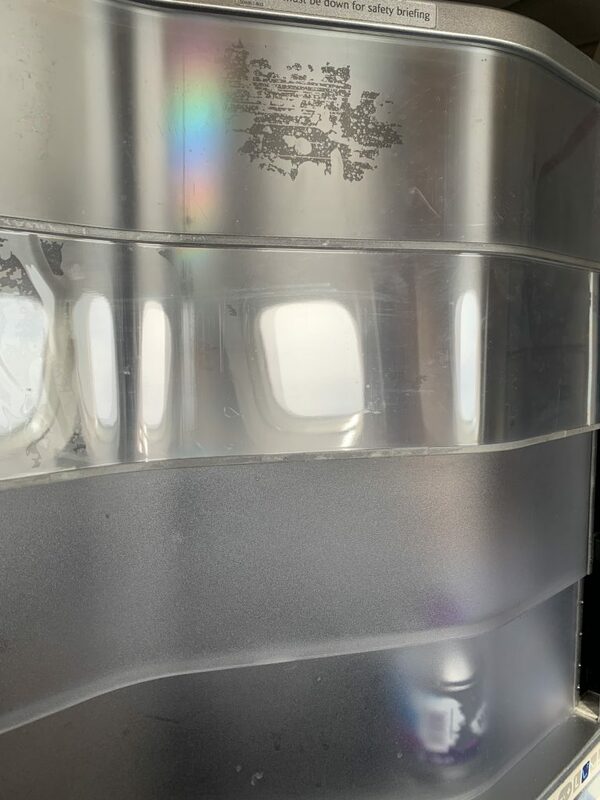 If it was not for Anoushka (who seems to be one of the few exceptions) and you had one of the lukewarm crew members that are very common in BA flights and if you were not able to choose one of the best seats in the plane, what would actually be good with this experience? Even at the really good cost you managed to lock, the cost/value ration is just terrible. And there is no light at the end of the tunnel, other than the tiny candle light of the new seats that will be implemented slowly and on a minority of the fleet. I dont like the heavy glass they put the water in either makes taking tray awkward and is not good on the flimsy table. Great review as always! I too miss the afternoon tea. As an American, it’s something that is still a novelty, usually only done in luxury hotels on weekends. Just discovered this website, and already a big fan. Well done! BA is truly in a terrible state. But luckily they have Heathrow sewn up so they are fine. That Haute Cabiere wine is a favourite lunch wine in summer! Review was spot on based on my last two CW upper deck BA747 trips. Especially the video screens… Unfortunately stuck with 64B for my trip in a couple of weeks. Hopefully the 62a / k seat opens up during online checkin ! Regrettably I think it will only be mechanical maintenance and servicing that the glorious jumbos will get now with them all being earmarked for scrap. When we travelled with our daughter we were 60 j and k and 61 j. There is no trouble from the fore lavatory as always assumed. Now my wife and I do 60 b and j. Privvy screen up and direct aisle. Carryons go in the wardrobe at the top of the stairs. Are you attending the Cellars in the sky wine tasting on Monday evening, Michele?